The breakdown diode is an electrical component which will have the two electrodes. The two electrodes are anode and cathode. Most of the diodes are made up of semiconductor materials like silicon and germanium etc.The basic property of the diode is to conduct the electrical current in only in one direction and block the current which is in the opposite direction. If the cathode is negatively charged which is related to the anode next to a voltage is greater than the minimum is called as the forward breaker and the current flows in the diode. If the cathode is positive with respect to the anode, it is negative by an amount less than the forward break over voltage, hence the voltage does not conduct the current. The switch and diode characteristics are similar to each other and the earlier semiconductor device was the crystal detector and used in the wireless radio. The different kinds of breakdown diodes include Zener diode, Schottky diode, and Avalanche diode. 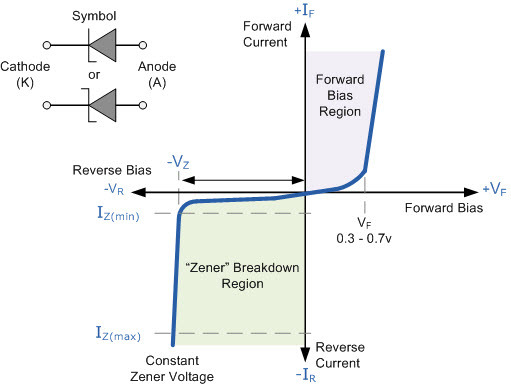 The Zener diode is a special diode and the current flows in the forward direction. This diode is different from the other diode i.e. the current flows in the reverse direction. When the voltage is at a certain level, then the breakdown voltage is called as the Zener voltage. The standard diode has the high Zener voltage and the diode is damaged if the reverse current is allowed to pass through it. The Zener diode is designed to use where the Zener voltage is very low. If the diodes are not damaged then there is a control in the breakdown. The electrical breakdown of any metals like a conductor, semiconductor and insulator can produce due to two different phenomena. The first one is Zener breakdown and the other one is an avalanche breakdown. The two phenomena are like natural occurrence and generally we all know that the insulator is under normal condition in the air. In the below section we have discussed the Zener and avalanche breakdown. The following diagram shows the PN junction characteristics and in this, we can observe the curves of the Zener diode and avalanche diode. 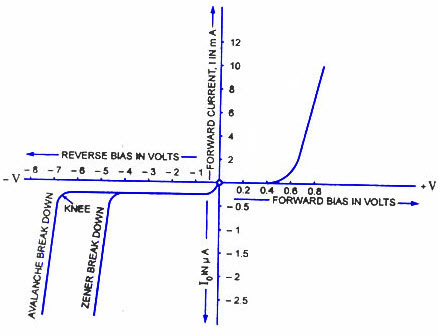 The forward and reverse bias are calculated in volts. 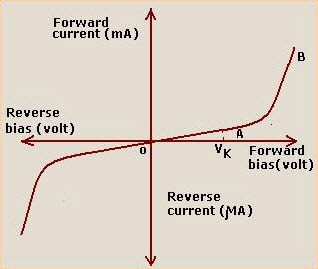 The current which is forward direction is in milliamperes and the current which is in the reverse direction is calculated in the form of microamperes. If the reverse voltage is increased in the PN junction diode thus the electric field near the diode junction increases. Hence the result will be in the force of attraction to the negatively charged electrons nearby the junction. The force from this junction will free electrons from the covalent bond and moves the free electrons to conduct the band. When the electric field is increased with the help of the applied voltage then the more electrons are free from the covalent bond. Hence the result will be drifting the electrons across the junction and the recombination of electron-hole occurs. At the end, the current will flow and there is an increase in the electric field. The more zen diode will occur at the PN junction diode within the junction and heavy doping. The avalanche breakdown is produced at the PN junction. It has thick junction and doped moderately. In general, the avalanche breakdown is produced when the high reverse voltage is applied across the diode. If there is an increase in the applied voltage then there is an increase in the electric field near the junction. Let us consider that the applied reverse voltage is Va and the width of the depletion layer is d. Hence the generated electric field is calculated as the Ea = Va/d. The generated electric field applies force at the junction to the electronics and they are freeing them from the covalent bonds. With the help of the high velocity, the free electrons will move across the junction and it will gain the acceleration. Thus the result will be in the collision with the neighboring atoms because of the collision very high velocity, in the further, it will produce the free electrons. At the end these electrons will start the drifting and electron-hole pair recombination will produce at the junction. The net current will be increased. The following diagram shows the VI characteristics of the Schottky diode and in the graph, we can observe that in the forward direction the current increases exponentially, having the turn on voltage up to 0.2V. In the reverse direction, there will be a greater level of reverse current than the experienced using a more conventional PN junction diode. We will use a guard ring in the fabrication of the diode which will manage the performance of the forward and reverse direction. The main advantage of the incorporating a guard ring in the structure to improve the characteristics of the reverse breakdown. The breakdown voltage difference is about the 4: 1 between the two – the guard ring will prove the distinct improvements in the reverse breakdown. There will be a reverse breakdown of 5 to 10V to small signal diodes without a guard ring. In this article, we have discussed the different types of breakdown diodes and its applications. I hope by reading this article you have gained some basic knowledge about the types of breakdown diodes. 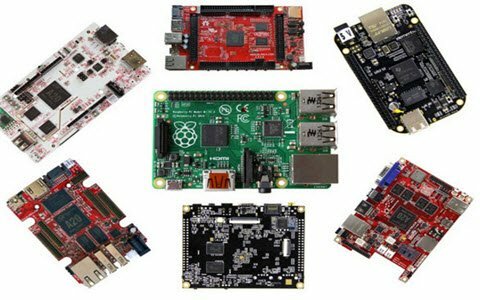 If you have any queries about this article or practical guide to building electronics projects based on engineering please free to comment in the below section. Here is the question for you, What is the functions of the Zener diode? Thanks for the post. I get clear understamding about breakdown diode by reading this article.